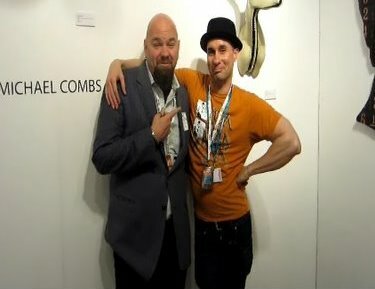 On Sunday during the last day of the Pulse art fair in Miami, New Orleans gallerist Jonathan Ferrara and his cute — director? assistant director? gallery ninja? — whose name unfortunately failed to record, were willing to see and be seen with me, Devon Britt-Darby. They did so even after learning about my colorful past and the loss of my recent platform, the Houston Chronicle. Ferrara didn’t mince words when discussing the Houston Press’ 2009 character assassination attempt on Prospect.1 New Orleans artist Paul Villinski. He also offered an update on Skylar Fein, whose installation Remember the Upstairs Lounge was both the first show I saw at the biennial and the one that stuck with me the most. Ferrara also discussed his Houston Fine Art Fair experience off the record, as did many other gallerists at Pulse and Art Miami, some of whom know that ho, some of whom don’t. A recap and highlight reel are coming soon.